November 20, 2013, 10:04 a.m.
With the autumn statement two weeks away, the Conservatives leadership is under internal pressure to reduce taxation. On Monday the Free Enterprise group of Tory MPs proposed £13bn of tax cuts for the middle classes, funded by halving the number of Whitehall departments, strict public sector pay limits and a three-year tax freeze on non-pension benefits. The Lib Dems preferred tax policy is raising the income tax threshold to £10,500. 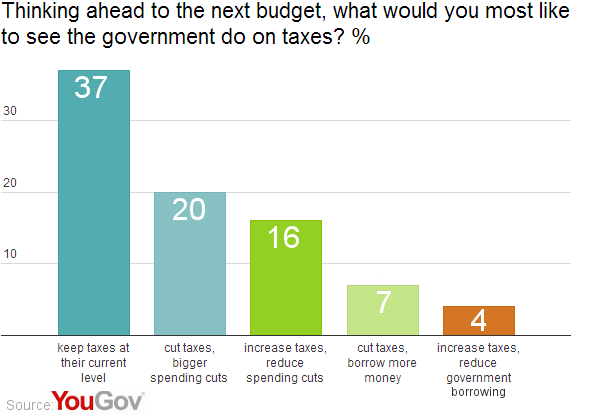 In new research, YouGov asked about a range of options on taxation – from cutting taxes while increasing borrowing to increasing taxes while reducing spending cuts – and found the most popular option is to keep taxes at their current level. And whilst nearly half of voters would prefer a different tact on taxation, there is little consensus on what that should be. Of the options presented, 37% prefer taxes remain at their current level. A further 20% would like to see tax cuts paid for by bigger spending cuts and 16% would prefer higher tax rises in order to fund reductions in public spending cuts. Much less popular are options that involve balancing out changes in taxation with changes in the amount of government borrowing. Despite calls from within the party for lower taxes, Conservative voters are the most likely to want taxes to remain at their current level (51%), followed by Lib Dem voters (42%). 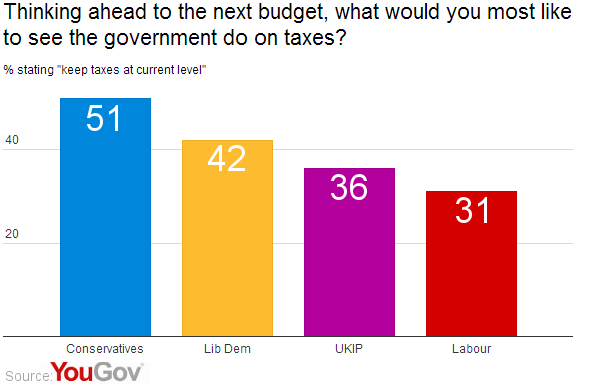 Labour voters are the least likely to want taxes to remain at their current level (31%). A look at the next most popular options – tax cuts with more spending cuts or tax rises with fewer spending cuts – gives a better indication of some of the political divisions that exist on tax policy. 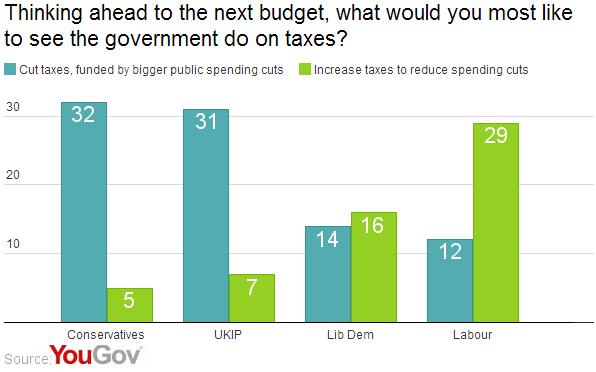 Conservatives prefer tax cuts over tax increases by 32% to 5% and UKIP prefer them by 31% to 7%. Lib Dem voters are more or less evenly split (14%-16%) and Labour voters are much more likely to tolerate tax rises in return for reduced spending cuts (12%-29%). The autumn statement is due on the 5th of December, having been pushed back 24 hours to accomodate David Cameron&apos;s trade mission to China.